Circuit Blocks exist in many different forms throughout museums around the world. 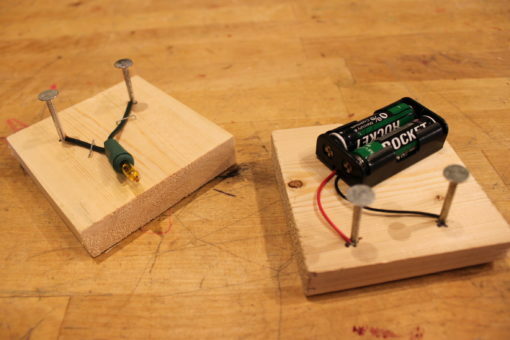 A circuit block is a set of components, switches and power sources that can be tethered together to allow people to explore electricity in a safe and easy manner. We have been building and facilitating circuit exploration for the past several years at the Children’s Museum of Pittsburgh. 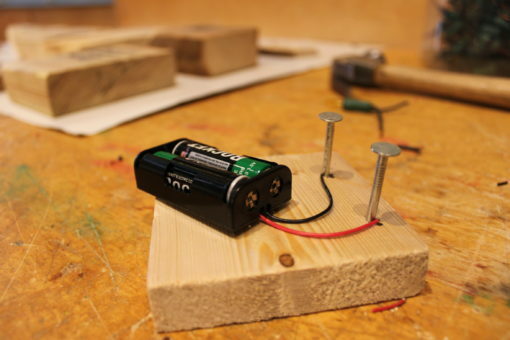 Circuit Blocks have become a staple activity in MAKESHOP. We don’t buy our circuit blocks from some special museum store. We make them ourselves. 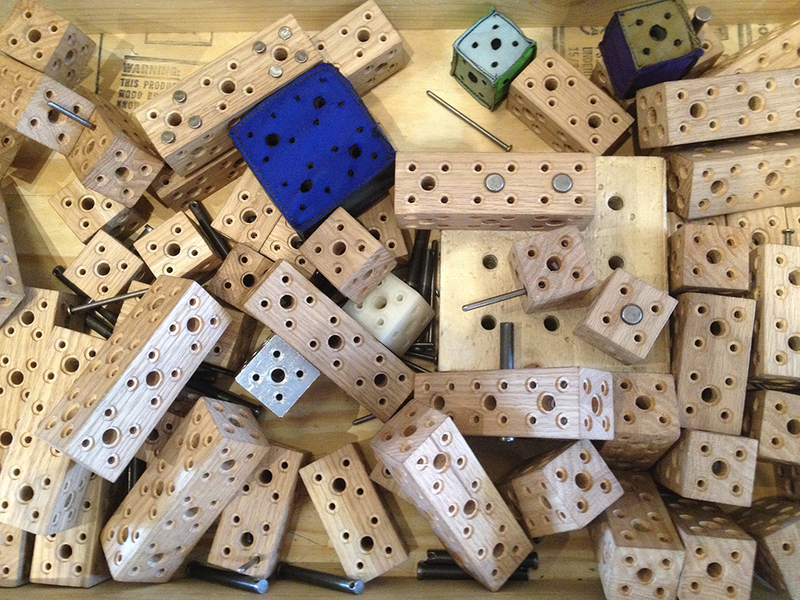 All of the Teaching Artists in MAKESHOP have their own distinct style of circuit block; some are more refined than others. 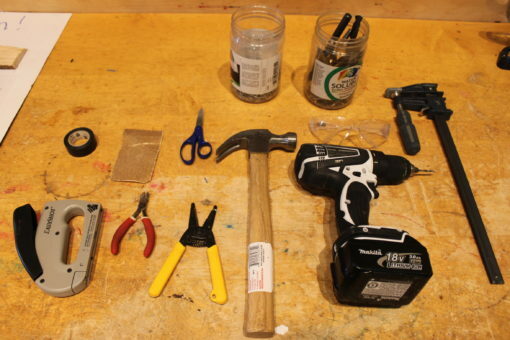 All of the Circuit Blocks start with the same set of tools and materials. 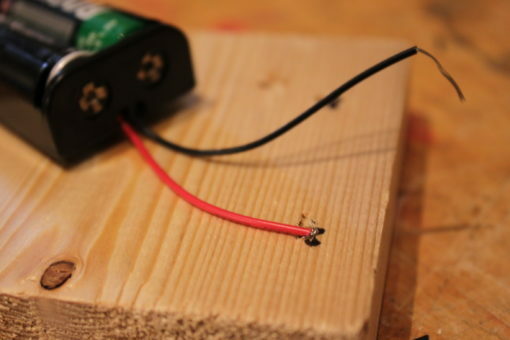 The following instructions will give you a general idea of how to create a simple power source block and a component block. First we start with the tools needed to construct a block. *If you do not have a small block of wood (roughly 4″X4″) then you will need to use a saw to cut your wood. 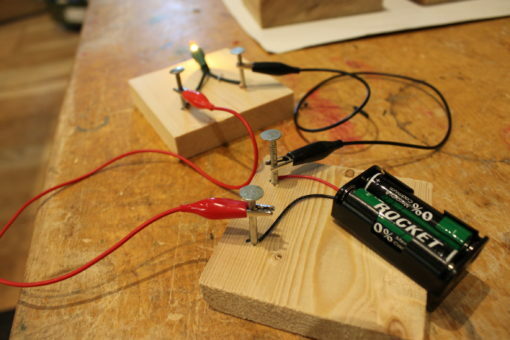 You can also experiment with other materials for the block part of the circuit block. I have used foam, cardboard and plastic. *For this example I am using holiday lights. Other components include motors, speakers, LED lights and buzzers. After you have gathered all of your tools and materials you will need a clean work space; a nice sturdy table is the best space to work. 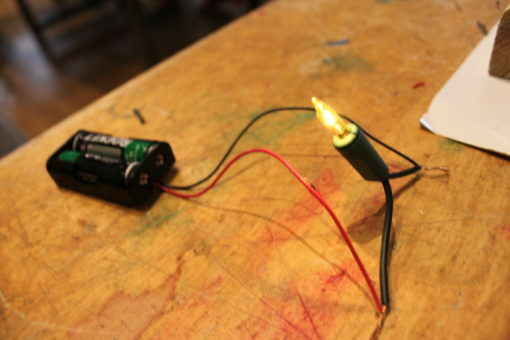 The first step is prepping and testing your holiday light. Use the wire cutters to remove a single light plus a little extra wire from the chain of lights. 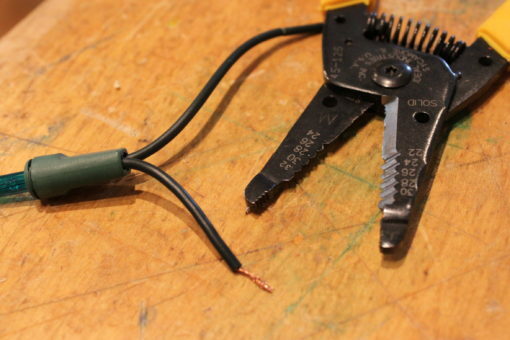 Next, use the wire strippers to remove a little bit of the plastic insulation off of the wire. You will need to expose some of the conductive metal wire inside of the plastic coating. 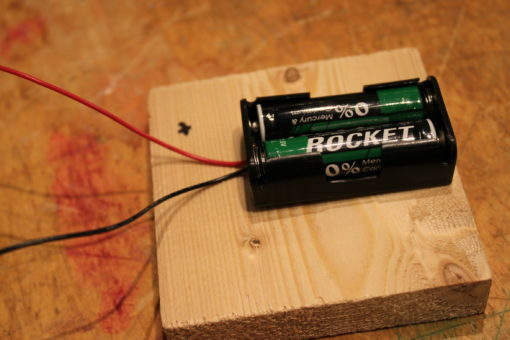 Next, place your batteries into the battery clip (be sure that they are facing the correct direction; positive with positive and negative with negative). *The negative end of the battery typically presses against the spring in the battery clip. Now its time to test the light. Hook up the the red and black wires from the battery clip to the exposed wires on the light. This will complete a circuit. If the light works then it will turn on and light up. Now you know that both your light and batteries work. There is no reason to construct an entire block and then discover that your component or part didn’t work in the first place. Always test, test, test. Now you can begin building the actual circuit block. Let’s start with a power source block. I like to make sure that my piece of wood is big enough to accommodate both the battery clip plus two nails or metal posts to connect to. I lay the battery on the block and then mark where my nails are going to go. This step will help with future steps. 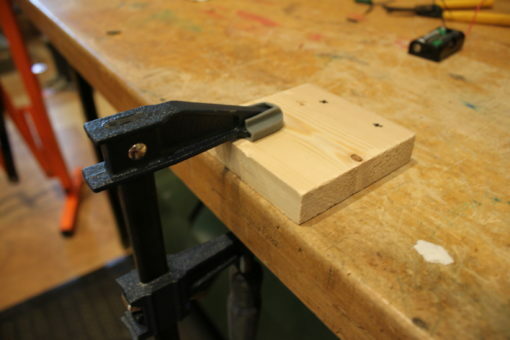 Next, clamp your piece of wood to a sturdy work surface. 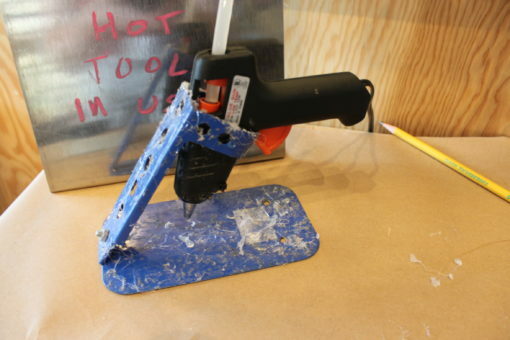 Put on your safety glasses and proceed to drill a shallow hole into the spots in the wood. A battery clip will only require two holes. 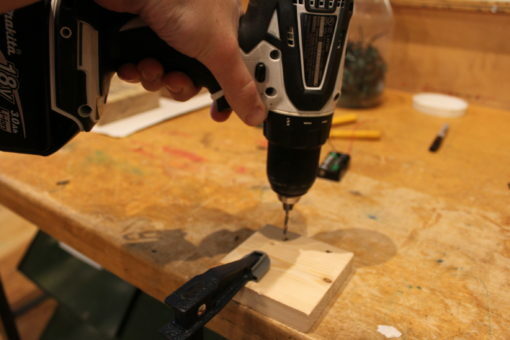 You can either use a power drill or hand drill for this step. I prefer a hand drill because you have more control over how deep your hole goes. Do not drill entirely through the wood. You are just creating a space for the wires from the components to fit. Next, stick the red and black exposed wires from the battery clip into the holes. Make sure the exposed metal is in the hole. 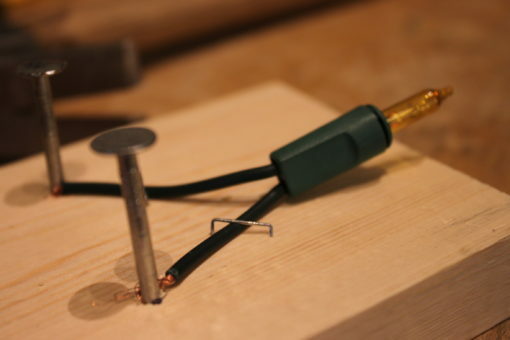 To secure the wire in the hole place a nail on top of the wire and gently push the nail into the pre-drilled hole. 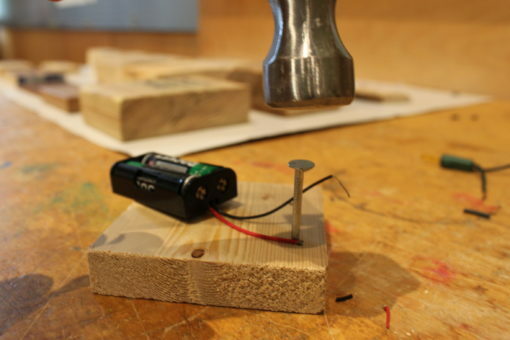 Use a hammer to gently tap the nail securely into place. Try to not pound the nail in too far as it will start to poke out the other side (this will cause the blocks to scratch up any surface they are on). 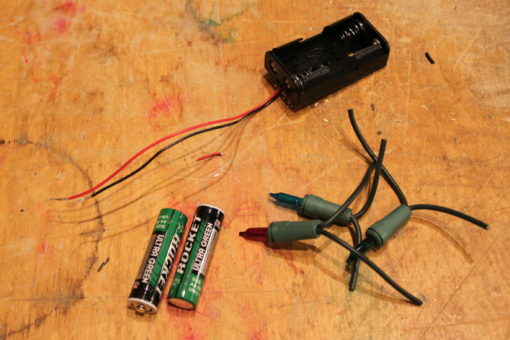 Repeat these steps for the other wire coming out of the battery clip. And there you have it; a power source circuit block. Now you have a means to test other components for future circuit blocks. Now on to the light block. 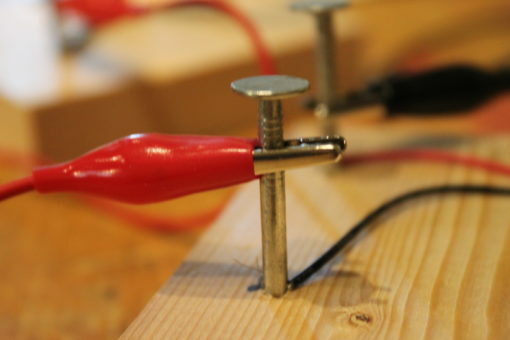 Follow the same steps for exposing the wires, drilling the holes and hammering the nails that you did for the power source block. What I do to hold the light in place on the block is simply staple down the two wires. Be sure to wear safety glasses/goggles during this step. 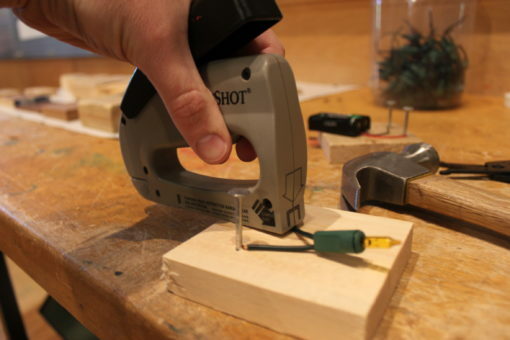 Use the staple gun to secure each wire into the wood. This step is important for future circuit blocks that you may build. You do not want a lot of loose wires hanging from the blocks. 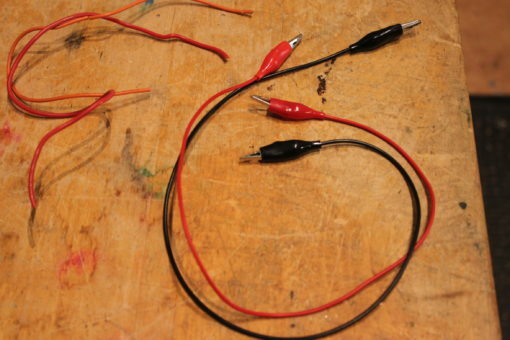 These wires can get stuck and pulled out of the components causing them to break. You can also secure the wires with electrical tape. Now you have a finished light block. Be sure to test it with you batter block to see if it still works. 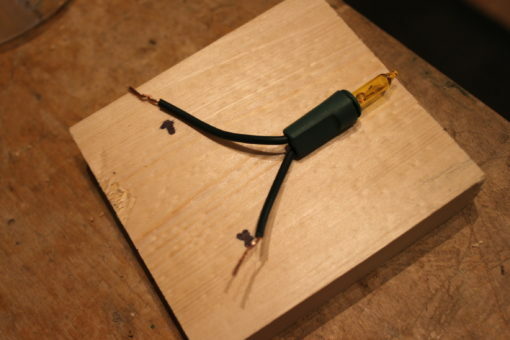 In MAKESHOP we typically use alligator clip leads to attach our circuit blocks together. These can be purchased online or at a local electronics store. If these are not available then you can also use anything conductive to connect your blocks together; paper clips, aluminum foil, etc. The alligator clips are nice because they can create a nice connection when clipped onto the nails. One last step with the power source block. 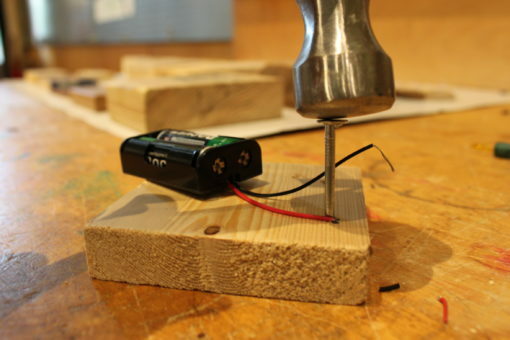 I like to use some hot glue to help secure the battery clip in place on the wooden block. 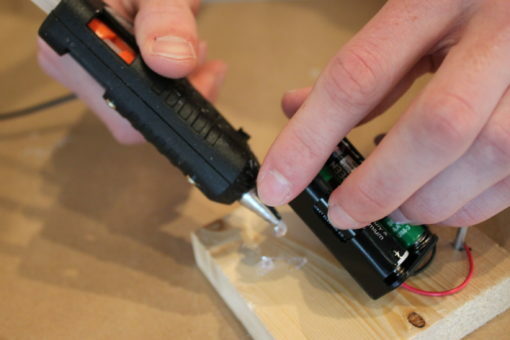 With other circuit blocks you will also want to use glue or tape to hold the components in place. Hello – do the nails need to be the zinc kind? As long as they’re conductive, they’ll work! That can also be a part of the design and building process, especially if creating them with young learners — testing to see what types of materials are going to work best.